Connect with your legislature. Make an impact. 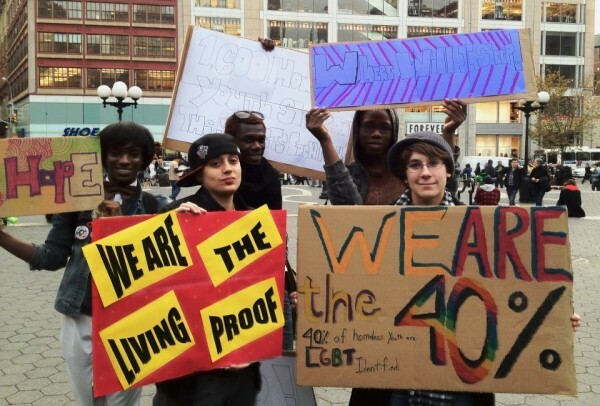 Homeless LGBTQ youth raise awareness about their struggles. Image from Instinct Magazine. While the momentum of the marriage equality movement deserves celebration this Pride Month, it’s important to recognize that there’s still a lot of work to do to achieve equity for the lesbian, gay, bisexual, transgender and queer community. As many as 40 percent of homeless youth identify as LGBTQ, and oftentimes they end up trapped in a cycle of abuse, poverty, and street life that lasts well into adulthood. Guest blogger Sarah Bartlett illuminates some of the struggles with poverty and homelessness that many members of the LGBTQ community experience.